Where would agriculture be without honey bee pollination? It’s estimated that bees pollinate around a third of the food we eat. Vegetables such as corgettes, peas and beans, as well as fruit and some nut trees, including apples, pears, raspberries, strawberries, blueberries, and almonds need bees for a good yield, among many other food crops. Bees also pollinate many of the flowers, plants and trees that in some way, feed other creatures. One question I am frequently asked is this: if bees disappeared, could other insects step in and do the pollinating, thus ensuring food supply and bioodiversity, or would we starve? This question is explored here. I am also sometimes asked whether honey bees specifically, really matter. In my view, they are immensely important (as well as enchanting) creatures, and not merely because they are pollinators. This question is explored here. Yet, honey bees are not the only pollinators and sometimes they are not so effective at pollinating certain crops, so why are they the species most commonly used for pollination? The practice of beekeeping has meant that large numbers of honey bees are available to farmers, and can be transported from one field to another. Even the timing can be controlled. It has led to the development of a whole industry based around honey bee pollination. Some beekeepers specialise in this service. “….in Europe, a region better studied than most, about 250 plant species are grown as crops. Of these, about 150 are thought to be insect pollinated, but for most we do not know which insects pollinate them, or whether yields are being limited by inadequate pollination “; From: Prof. Dave Goulson; citing Corbet et al 1991 & Williams 1995. So what does this mean in practice? It means that although the honey bee pollination industry is well developed, there has been little information about how effective they are, or whether they have been helped out by other native, wild species. Certainly, until recent years, little incentive has existed to rear different bees and insects for pollination, such as for use in poly tunnels. However, things are beginning to change, and other bees, such as bumblebees and leafcutter bees, are being used to help increase agricultural production. Bumblebees have been used to pollinate tomatoes for some years. Partly this is due to increasing recognition of the importance of other bee species, coupled with research in this area. Perhaps also, it is due to fears about over reliance on the honey bee. There is also a growing movement to help farmers understand how they can encourage local native pollinators onto their land, by providing nest boxes for solitary bees. 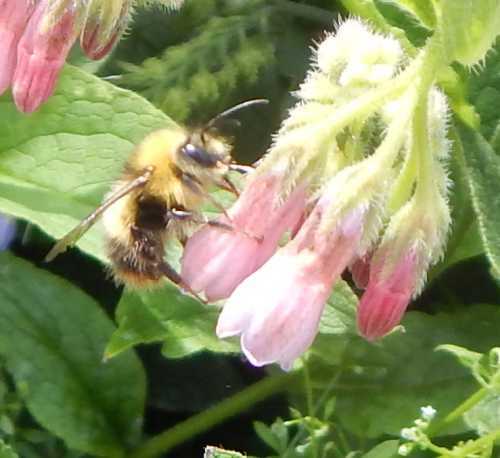 Bumblebee colonies can also be purchased, but has sometimes led to negative consequences when a commercially reared species has been moved from one region to another (not natural to it), taking with them diseases that have impacted upon the local native species. You can read more about this on my page about bumble bees for pollination. 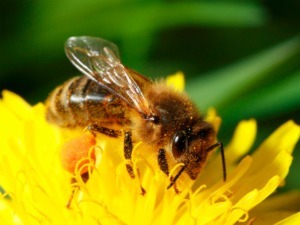 How do Honey Bees Pollinate? Like other insects, honey bees pollinate plants as they forage on the flowers. As they gather pollen and nectar to return to their hives, they transfer pollen from one flwoer to another. Pollen (containing the male eggs – or gametes) sticks to a honey bee body from the anthers of the flowers. As the bee then moves on to other flowers, they take the pollen with them, transferring it onto the stigma – the female part - of the next flower (the stigma is often sticky). This initiates the plant pollination process. Where insect pollinators are needed, honey bee pollination is by far the most commonly used in agriculutre, but other bees are important too. Find out more about bees and pollination here. Bumblebees are excellent pollinators in gardens, the countryside, and on farmlands. Find out why. Bees are not the only pollinators of the insect world. 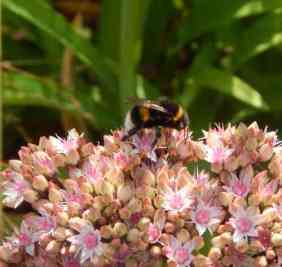 Find out more about other pollinating insects. Find out how flowers cleverly attract the different pollinators they need. Want to know about Wind Pollination? Although most plants require the help of a moving, living creature for pollination, not all plants do. Learn more here. How and why have some plants evolved the ability to pollinate themselves? Find out! Cross pollination promotes biodiversity. Explore how plants have adapted to aid cross pollination. Link back from Honey Bee Pollination to Home page.